Britain calls them nerve agent hit men. Russians ask whether they are gay. © -/AFP/Getty Images An image taken from Sept. 12 footage by the Kremlin-backed RT news network shows the two Russian nationals who identified themselves as Alexander Petrov and Ruslan Boshirov, speaking with RT editor Margarita Simonyan in Moscow. When Alexander Petrov and Ruslan Boshirov went on Kremlin-backed channel RT this week to defend themselves from British allegations that they attacked a former Russian double agent and his daughter with a nerve agent on British soil, the interview wasn’t only about whether they poisoned anyone. Instead, it raised questions about whether the two men are gay. 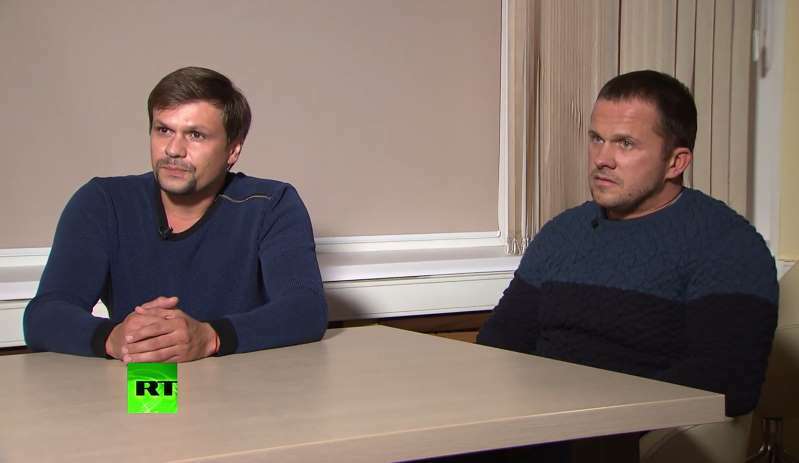 The pair claimed in the RT interview that they were in Salisbury around the time that Sergei Skripal and his daughter were poisoned but were there on holiday to see the spire atop Salisbury Cathedral. In the interview, they claimed friends had recommended Salisbury as a tourist destination. The intrusive questions about their sexuality raised speculation that the host was trying to deflect attention from suspected poisoning and instead focus viewers' attention on how exactly the two men know each other. Observers warned against seeing the inquiry as anything more than a distraction mechanism. Radio Free Europe wrote that Rossia 24 news channel later presented a piece on Salisbury, describing it as a place that embodies “modern European tolerance.” The presenter stood in front of a screen that said “Salisbury Pride,” with an image of the much-discussed steeple painted as a rainbow. He pointed to the fact that some find it believable that the suspects were indeed a gay couple going on vacation in Salisbury as evidence that such distractions can be effective. Amie Ferris-Rotman contributed to this report from Moscow. World - U.S. Daily News: Britain calls them nerve agent hit men. Russians ask whether they are gay.